Shelter Insurance Company took premiums on multiple policies, then refused to “stack”, or pay out the combined amount of the policies. We led the fight on behalf of the Long family to collect on all the policies they had paid into. The court ruled in favor of the Long family and the right to stack claims from multiple policies is now established insurance law. Largest personal injury verdict in the history of Carroll County: The jury returned a unanimous decision awarding Mrs. Smart $350,000.00. Our firm provides caring representation in Personal Injury Law and beyond. We understand that serious injury can be devastating. It is why we prepare each case so thoroughly and fight so determinedly in the courtroom. 1We will not settle for less than you are entitled to under the law. We promise to work hard and to fully explore all dimensions of your personal injury case. 2Our successful track record includes litigation against insurance companies that deny claims or fail to protect the rights of the insured. 3We know the loss of a loved one is a tremendous blow to a family. That’s why we take the time to ensure that you have a partner who will help you put your life back together. Personal injury cases are often more complex than they appear at first glance, and a quick, but cheap, settlement might not be the best outcome for you. 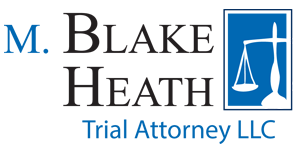 At M. Blake Heath, Trial Attorney LLC, we will thoroughly investigate every aspect of your case to determine who is liable and why and work hard to ensure you are fully compensated for your damages.